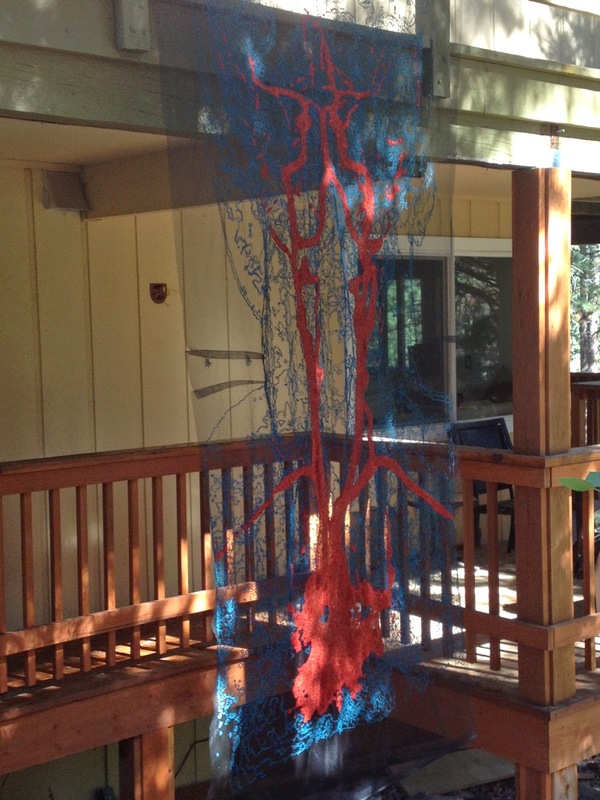 Getting ready to ship my piece, Head MRA, to the San Jose Quilt & Textile Museum, I had to resort to persuasion--hanging it from my 2nd story deck. It's so large, I don't have a space 12' high to hang it. So misting it & letting it hang allowed it to try to get its wrinkles out from being stored on a roller for months. My neighbors probably were wondering what I was doing. This is so exciting! I love these artists' work & can't wait to see what they've produced for this show. And hopefully, some of the artists will be at the opening reception, August 10. An artist walkthrough will take place 1-2 and reception from 2-4. The show runs from July 26th through November 9. Hope you get a chance to visit this show. 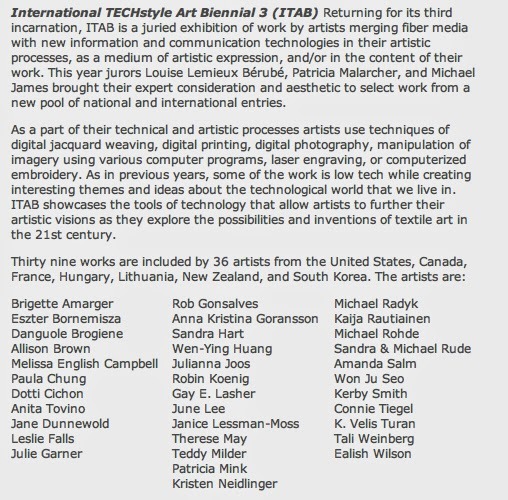 I've been honored to have been chosen to be one of the participating artists in ITAB, a show based on technology, hosted by the San Jose Museum of Quilts & Textiles. The Museum’s signature exhibition—the third Inter- national TECHstyle Art Biennial (ITAB)—will fill the galleries from July 26 – November 9, 2014. This year 70 artists submitted 135 artworks. Jurors and distinguished artists Louise Lemieux Bérubé, Michael James, and Patricia Malarcher selected a fascinating mix of 39 pieces that related to the theme and description of the exhibit. Jurors were asked to select works by artists merging fiber media with new information and communication technologies in their artistic processes, as a medium of artistic expression, or in the content of their work. This year for the first time we contracted with an off-site website, Art Call to help facilitate the entry and jury process. The artists applied directly to the website and uploaded their information and images. The jurors were able to see images, details, and information about the artwork except for the artists names and personal information. It was an easy application process and saved hours of administrative work for Museum staff. It was both a fitting trial run for a tech- themed exhibit and a successful way for applicants, jurors, and staff to process a lot of detailed information. As anticipated, artists responded with digitally printed works, videos, computer-aided designs, and jacquard weaving. Some highlights of the exhibit include two gorgeous and dramatic jacquard weavings by Janice Lessman-Moss. These complicated and multi-layered designs could only be woven with the aid of a digital jacquard loom, as the patterns, more like abstract paintings, never repeat. The underlying fabric layer of hand– felted wool creates a dynamic and interesting border and textural contrast to the astounding patterns. 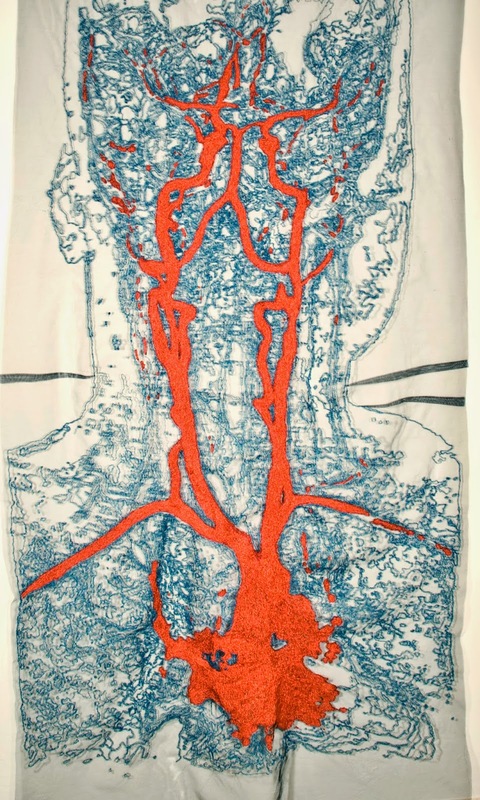 The large scale work by Paula Chung, "Head MRA," is a powerful portrait of what is seen through the lens of a medical procedure. Although the piece references an intimate and personal health experience it also shows the strength and vulnerability of what lies beneath our skin. In contrast a small scale work by Melissa English Campbell is a tour de force of how one perceives and creates an image. Composed of 2,640 layers of digitally printed cotton sateen, "Our Sons" reveals a remarkable portrait on all sides of the stacked cube. 3D printed, EEG brain sensor— that maps thoughts and exhibits brain states with color. Created by Kristin Neidlinger and a team of software, hardware, and 3D modeling engineers, and knit designers, this electrified “hat” reads brain states and translates this into colors from red indicating Delta or deep sleep, to orange for Theta state or meditation, to yellow green for Beta or consciousness. ITAB once again provides a thought provoking and fascinating look at the creative merging of textile and technology. You can see the whole newsletter here.